Do you love gardening but have space constraints? There is amazing way—container gardening—to revel the joy of conventional gardening, even though when you have limited space. This fun way allows people with little space, such as balconies or small patios, to have a garden, without hiring a garden service. The whole practice started when condominiums or multistory apartments mushroomed all over the country. In the container gardening, as the name suggests, plants or herbs, such as bougainvillea and fuchsia, are planted in small containers. This is an inexpensive way of gardening. You can use anything for a gardening container, be it pottery, plastic containers, window boxes, old barrels, or watering cans. There is no the limit. The most crucial thing about the container is the drainage; the excess of water should not accumulate in the bottom, a small opening will serve the purpose. You need to water them consistently, smaller the container, the more frequently it will need water. In weather when the transpiration is high, that is, during summers, hanging baskets may need to be watered daily. To make your containers light, instead of using only soil as a base, use ole bark mulch and Styrofoam peanuts in the bottom half of containers. The bark helps to tie-up soil nitrogen, giving nourishment your plant needs. The soil used for container gardening is special; it should allow roots to grow easily, be water retentive and also helps fast draining. The best way to have a soil with such attributes is to mix it with compost. Watering the plants frequently will drain the nutrients away from the soil; therefore, it is essential that you add fertilizer. To be environmental friendly, use a water-soluble fertilizer. What you can grow in containers? You can grow anything that you want, unless it can be planted in a container. Most people grow annuals, perennials, tropicals, and even vegetables and herbs. However, there is a thing that you need to care about, when you choose a plant to grow in a container, be sure of the size of the plant when it will mature, the container should be of same scale. 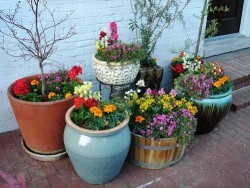 The container gardening are not only attractive, adding beauty to your landscape but also is useful. It can provide enough herbs and vegetables. Grow a container garden in your balcony and get a supply of fresh herbs and vegetables for your dishes.